Every now and then I see a knife that I absolutely have to own. Now, believe it or not, my collection of knives is small in comparison to the size (and value) of many knife collectors, so I like to think I exercise some “restraint” in my purchases. This might have more to do with the size of my bank account than anything else, but my point is, this knife really struck me as something special, and I bought it. I am talking about the Boker Exskelibur, a collaboration between Boker Knives and South African custom knifemakers Mike Skellern and Fred Burger. The Exskelibur is part of Boker’s “Plus” Line which is their line of high quality value knives. For purposes of the review I would classify the Exskelibur as a EDC knife, and perhaps even a collectors knife. I know mine wont be seeing much use even despite the very reasonable price tag – I simply want to keep this knife nice for my collection. What we really have here is a gentleman’s folder; it’s simple lines and rich titanium accents make the Exskelibur an exercise in minimalism and elegance that will feel very at home in an office or carried during a formal event. I have found the attention to detail and build quality on this knife to be extraordinarily high. What may be most surprising to some readers is that this knife is made in China. Now, my Spyderco Tenacious review showed that Chinese manufacturing isn’t always synonymous with low quality, but the Exskelibur isn’t just well made for a Chinese knife – it’s well made for any knife. The Exskelibur I has a 3 5/8″ blade, an overall length of 8″ and a weight of 3.3 oz. Due to the advanced handle construction almost all of that weight is in the blade. And speaking of the blade, what a beautiful piece of steel. It’s a large and simple drop point design with a high hollow grind. The blade has been given a nice satin finish that glows under the light of my studio. What strikes me about the blade is how big it is relative to the handle. The blade to handle ratio is very impressive and has to be close to 1:1. The steel chosen here is 440C, which is a mid grade steel that is very popular in European knives. Seeing how this is a mid range knife I was very happy to find 440C here, it is one of my favorite all purpose knife steels. 440C is capable of taking a very keen edge and my Exskelibur I came shaving sharp right out of the box. The blade is beautifully finished and has a “Boker Plus” logo on one side and a Skellern logo on the other. The handle follows the same minimalist approach of the blade, while weaving in a couple interesting features that really elevates the style and sophistication of the knife. The handle is made almost entirely out of black G10. The G10 is very lightly textured and doesn’t offer much in the way of friction, however the there very good jimping on the spine of the knife and the handle has been contoured to allow your fingers to wrap around it comfortably. The resulting grip is very good for normal EDC tasks. I think the texturing is adequate and fits very well with the overall classy theme of the knife. The construction of the handle is not open, a piece of G10 runs the entire back length of the handle and in between that piece and the handle slab is a thin strip of red G10. This is purely for aesthetics and is a very interesting detail that makes the Exskelibur a little special and is really quite cool. The pocket clip is a piece of titanium that has been finished in a dark matte blue. It’s a little stiff but it performs well and is reversible for tip up or tip down carry (right side only). The clip is held in place by 3 small Phillips screws which is a bit of a departure from the allen or hex screws we often see. Another thing to note here is that there isn’t a lanyard hole in this knife. Since this is a larger EDC knife, I really don’t miss the lanyard hole, but I thought it was worth pointing out. The Exskelibur deploys with an unobtrusive flipper located on the back of the blade by the pivot. This is a very simple yet effective method of deployment. The blade moves easily and I find that I can quickly and easily open this knife with 1 hand. The bushings on this knife appear to be phosphor bronze and everything is very smooth. The knife opens quietly with a soft click as the blade snaps into the titanium liner lock. There is only one liner on the Exskelibur and it is made of the same blued titanium that clip is fabricated from. It makes the knife incredibly lightweight and it provides another interesting detail that sets the Eskelibur apart. I have found the lock to be strong and it locks in the middle of the open blade with no danger of slipping. The Exskelibur I is an outstanding folding pocket knife. The knife oozes style and is a simple and beautiful folder. I appreciate the great design and quality manufacturing and am not put off by the fact that this knife is made in China because the quality control here is outstanding. The titanium liners, the big sweeping blade and lightweight handle are all very appealing. I think 440C was an excellent choice for bladesteel and love how big and practical the blade is. It’s hard to find fault with the knife, I think if you use it as an EDC or gents folder you will be very pleased with the Eskelibur. 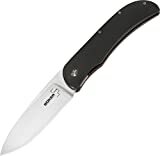 I recommend purchasing the Boker Exskelibur at Amazon.com or BladeHQ. Please consider that purchasing anything through any of the links on this website helps support BladeReviews.com, and keeps the site going. As always, any and all support is greatly appreciated. Thank you very much. Great review! I am really seriously interested in this knife. And the review made it worse. Yes, that is a great review Dan! I appreciate you demonstrating the one-hand opening with the notch — I completely missed it when looking at the Boker 2011 catalog — I thought it was a striking knife. I am considering getting one of these. Greg, these have wandered up in price a bit but I still think they are a very cool and very unique offering from Boker. Glad you found the review helpful and thanks for the kind words. Please let me know if there are any questions I can answer for you about this knife or anything else. Hi Dan, thanks again for this great site and your excellent reviews! 440c on that particular knife was machined and tempered in a good way, mostly being on a “dry” side. It held a fine cutting edge for a long time (in the hands of an unexperienced user!) which showed tendencies to chip rather than to tear when overloaded, did not corrode and was not a problem to sharpen. So I consider this knife to be a fine and inexpensive “gentleman’s folder” and a good gift, but should never use it for my EDC. Great review, Dan! Wanting to add a Boker to my collection…torn between the Exskelibur and the Whale. Thanks again for stopping by and leaving the nice comment. I bought one of these for use as a gentleman folder when in polite company. It has served me very well for this use. It has drawn also some comment as to who made it and such. All were very positive and loved how you can open it with one hand. It’s design is fairly unique there and makes it a good for a great conversation piece. I too think you would be hard pressed to find a better made factory knife anywhere. I only paid 40 bucks for it and think it was a great deal altogether. I am glad you like your Exskelibur. It doesn’t get a lot of publicity, but this is a thoughtfully designed and well executed knife. Different for most everything else in my collection. Thanks for stopping by and sharing your thoughts on it.